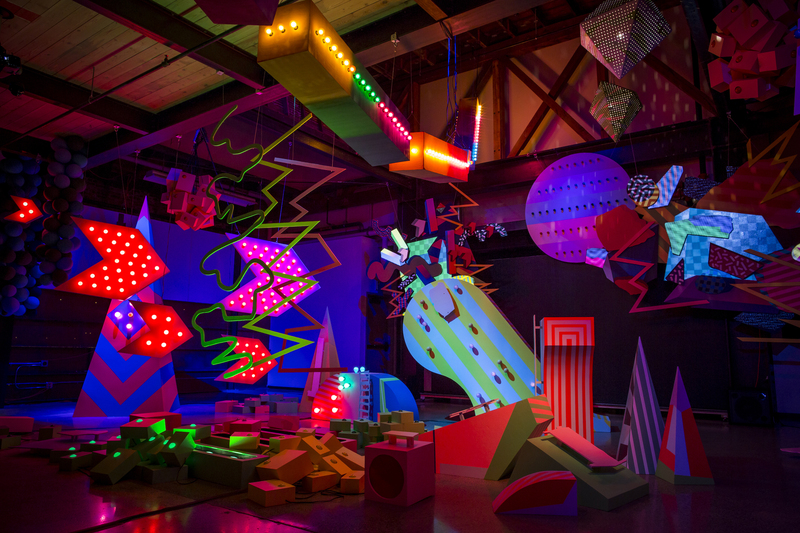 The Seattle-based art trio Let’s creates giant psychedelic multimedia sculptures. “Look but do not touch” is an alien concept to the Seattle art trio Let’s. 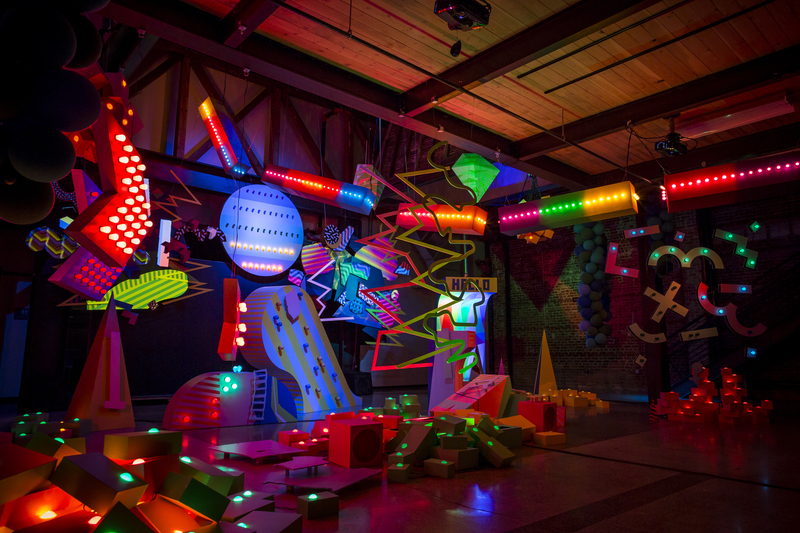 Their large-scale interactive sculptures are essentially musical instruments that allow people to have multisensory experiences that blend touch, sound, vision, and vibration into one psychedelic whole. In their most recent interactive sculpture, We, now on at MadArt gallery in Seattle, 12 people can collaborate in altering the immersive sculpture through light bulbs, music, and mapped video projections. Like their other work, We operates in similar way to the psychedelic whimsy of Pee Wee’s Playhouse puppeteer and artist Wayne White. As Let’s’ Courtney Barnebey tells Creators, one of the main ideas with We was to create a community and shared experience. It’s not just about visitors interacting with the sculpture, but with each other. Let’s, comprised of Andy Arkley, Courtney Barnebey, and Peter Lynch, have been working together for the last 15 years. Up until about five years ago, they had played music together in the band Library Science. Before that, Arkley had been in the Seattle band The Bran Flakes. Both bands, as Arkley says, used a lot of video elements and props on stage to create a multimedia experience. After breaking up in 2012, Arkley applied to create a show at Soil Gallery, where his wife was working at the time. All photos by James Harnois, courtesy of the artists. Barnebey notes that there is a division of labor within Let’s. Lynch, the most musically adept of the three, focuses on the music, while Arkley and Barnebey do most of the planning and building of sculptures. To make the music, Lynch records in Ableton Live with a combination of live instruments, synthesizers, and sampling, manipulating all of these sounds in various ways. Lynch then runs Ableton in the background, with each sample routed to a dedicated button on the sculpture. Each button, as Lynch explains, is essentially a sample trigger, which lines the triggered element up on the 8th or 16th note, synchronizing (or quantizing) the sample to a silent metronome. Lynch sets up Ableton such that it sends MIDI notes to the VJ software Resolume, which controls the projected video elements. Ableton also sends MIDI notes to DMX, a piece of software that triggers the sculptures light bulbs. Click here to see more work by Let’s. Do You want to know more about Video Mapping?